Hatters boss Nathan Jones didn’t think that star striker Danny Hylton got himself sent off on purpose against Notts County this afternoon. Town’s leading scorer had already earned his 14th caution of the campaign for a needless challenge on keeper Adam Collin in the first half, which would have left him one yellow card away from a three match ban. However, in injury time, Hylton then went in late on defender Carl Dickinson to see red, which will see him now suspended for Luton’s last two games of the season, but crucially, staying on 13 bookings for the play-off campaign. When asked afterwards if he felt the summer signing from Oxford orchestrated the decision, Jones said: “I don’t think he’s bright enough to have added it up and to have got it. “The way he got it, I don’t think that was one on purpose as I thought it was was such a stupid challenge. “I don’t want to say there’s any weird positivity (about staying on 13 bookings) because he’s shown a lack of discipline and for something we’ve spoken about and we speak about to him constantly. “The first one is just stupidity, he doesn’t need to get involved in that. Then he goes and stands on the keeper in terms of making the keeper kick it. “There’s only one slip up you need there, he’s got another one, so he makes me pull my hair out. “I love the kid, I really do, as he’s done unbelievably for me, but some days he makes you wonder what goes on his barnet. “But I’d prefer not to comment about it, and I don't want to cane him too much as he's been magnificent for me today apart from two acts of Dannny Hylton-ness. 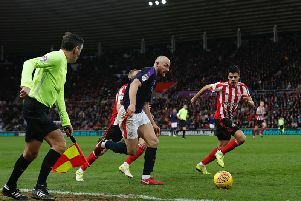 On whether he felt Hylton’s first booking was on the soft side, Jones continued: “If that’s a yellow card then we should have had about 150 today. “Because it’s a little bump and it’s just so silly, but he puts himself in that position to then do something stupid again, because we wanted him to press to stop forward play. “All we said to him late was you’ve got to stop forward play, because all they were doing was going to put that back in our box. I’d prefer not to comment on it too much as I get frustrated with him day in and day out. I try not to as he's so important to me, but some days he just makes me want to punch him." The timing of Hylton’s sending off gave Town a few minutes to hold on to at the end, with Jones not happy his side were put in such a precarious position, by their talismanic frontman. He said: “It just kills you really because he’s so honest in terms of what he does. “We said stop forward play, you cannot just let centre halves put it into our box as that’s the only threat they had late on. So he’s tried to do that, and was so tired at the end, and you think something’s going to happen, you think he’s going to miscontrol and dive in as he’s always on edge. Hylton had been unusually wasteful in front of goal, missing two one-on-ones, while sending another harder chance wide late on, as he couldn't add to his 26 goals for the campaign, with Jones adding: “Yes, but that’s not the frustration for me today with Danny, but he could have put it to bed a little bit earlier in terms of the chances he’s had. “Normally he tucks them away, no problem, that’s why he had the haul of 26 so far this season and that’s the only disappointment really in terms of our play. “Whenever he plays, if he plays well, if he plays brilliantly, if he’s just a little bit out of sorts, he always affects the game in some way or another, that’s Danny Hylton.